The fall line keeps changing with the terrain, it is not always "down towards the bottom" as the slope may have features like rollers and "fall aways". Also, the apex of the turn is not always in the fall line, although that is a good approximation and many tend to refer to both as being at the same time (we are guilty of that as well). Don't confuse, however, being in the fall line with being "at the gate" in racing. Being in the fall line simply means skis pointing straight down the hill, which on a course usually happens somewhere above the gate. Sometimes you will hear the imaginary line drawn from the gate down referred to as the fall line, i.e. the opposite of the riseline++ but that's infrequent and not what most mean by it. Turning the skis into the fall line is when they tend to pick up speed, as they glide straight down the hill. 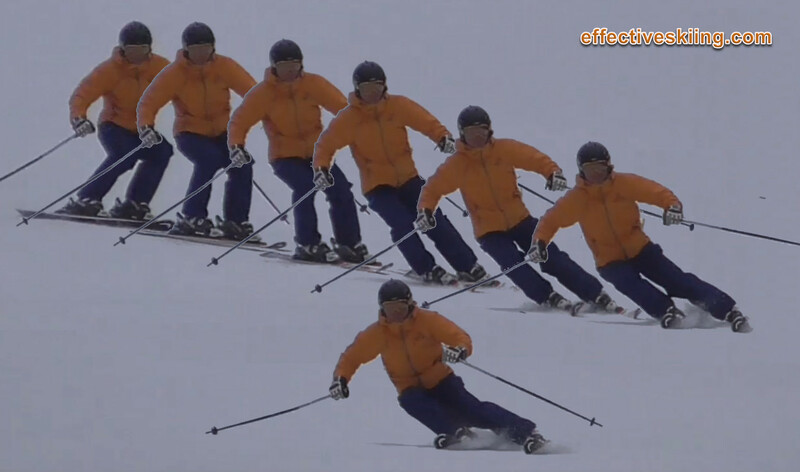 When the skis turn across the hill, they tend to loose speed, so a very effective speed control measure is to keep the skis pointing down as little as possible and pointing or turning to the side as much as possible. Viewed 608 times ( | Print ) this page.